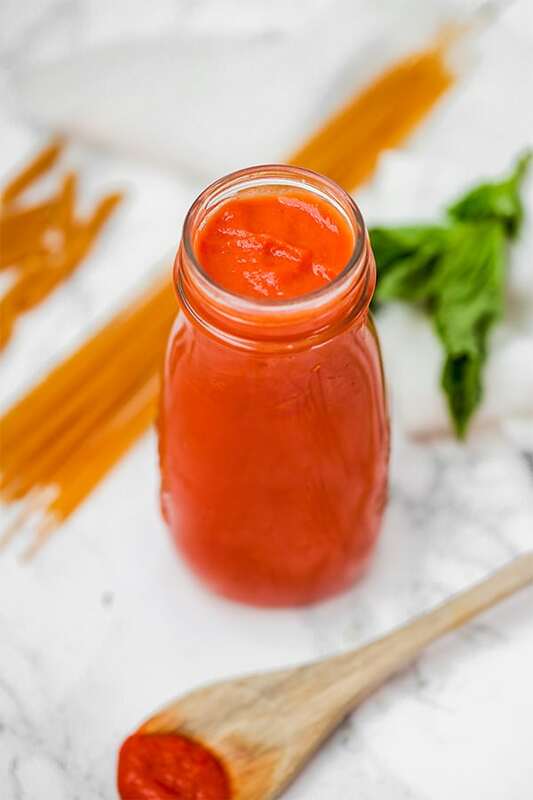 This nomato sauce is a nightshade-free marinara sauce that’s made without tomatoes! It’s AIP compliant, as well as Whole30, Paleo, and sugar-free. If you were to ask me what my favorite food was when I was a kid, I probably would’ve said pizza and pasta. I mean, can you blame me? Who doesn’t love pizza? I grew up in New York in a Jewish/Italian American family, and my dad always used to joke that spaghetti sauce ran through the veins, and thus, mine. That’s why my heart completely dropped when I first came to terms with my nightshade intolerance at 20 years old. No ketchup? No Caprese salad? No pizza?! Even gluten-free pizza?? Yes, white pizza exists, but no tomatoes, no pizza in my book. I thought that tomatoes were my best friend, but in reality, they were flaring my gut issues and Hashimoto’s symptoms, and my body just didn’t jive with them. I went about nine months being nightshade free before I was eventually able to discover the glory of nomato sauce. Wait, what? What the heck is nomato sauce? It’s a veggie-rich sauce made to taste like tomato sauce, but without the tomatoes. SCORE. I’ll never forget the first time I had nomato sauce after being nightshade free for 9 months! 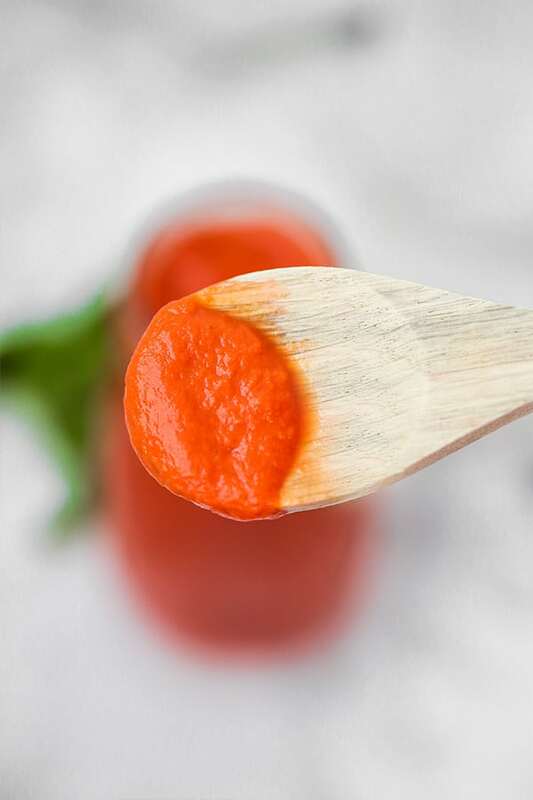 life changing as a nightshade-free Italian food lover to see the rich red sauce on your wooden spoon, smell the basil and taste all of the nostalgic flavors all over again. Over the years, I’ve tried a lot of nomato sauce, and in doing so I have perfected my dream nomato sauce! It’s just the right flavor, consistency, and it’s made quickly and easily in the Instant Pot. You’re seriously about 20 minutes away from having nightshade free tomato sauce right now. Carrots are the main veggie in this dish. They have a pretty neutral flavor and their color adds some of the red tint to the sauce. These add a ton of flavor to the sauce. Technically, you can leave out the garlic, but you’ll miss a lot of the flavor. Another crucial vegetable in this sauce. Lemon juice adds that acidity that tomatoes naturally have without being overly vinegary. I just don’t love the taste of apple cider vinegar in nomato sauce, but you can use that as well. If you don’t have an Instant Pot yet, I highly recommend it. It’s a safer pressure cooker that also has a slow cooker function, steam function, satuee function, and more. It’s saved me hours in the kitchen and can cook pretty much anything. I’ve included instructions to make this without an instant pot. However, it will more than double the cooking time, so seriously… this thing is life changing. The Vitamix is one of my favorite kitchen appliances. It just blends so well, and the damper insert is perfect for making chunky sauces like this nice and smooth. You can use other high speed blenders as well! I would not make any swaps rather than what may be noted in the section above. All of the ingredients listed should be used as is to get a great product. Your flavor will often vary depending on the veggies you have at the time. Something that I’ve learned from cooking with real food ingredients (especially vegetables) is that you don’t get that identical product like you would with processed food. The flavor of every carrot is going to be a little bit different, some beets are stronger than others, and sometimes your basil is a bit milder… that’s okay! I’m used to my nomato sauce always tasting just a tad different depending on the ingredients, the season, etc. so if it doesn’t taste identical each time, that doesn’t mean you did anything wrong! If you’re AIP, pair this sauce with spaghetti squash or zoodles! If you’re not AIP and can tolerate something like rice pasta or chickpea pasta (which are pictured in the picture above) go for it! Add the olive oil to the base of the instant pot and set to saute. Saute the onions and garlic for 2 minutes, before adding in the carrots, beets and celery. Saute for 5 minutes, stirring frequently. Press cancel to turn off the saute function. Pour in the water and lemon juice and add the seasonings. Stir to combine. Lock the lid onto the instant pot and flip the the pressure release valve to closed. Press “manual” (it will default to high pressure” and use the “+” button to set the time to 14 minutes. Allow the instant pot to come to pressure and the sauce to cook. Once the sauce has finished, carefully release the pressure valve. 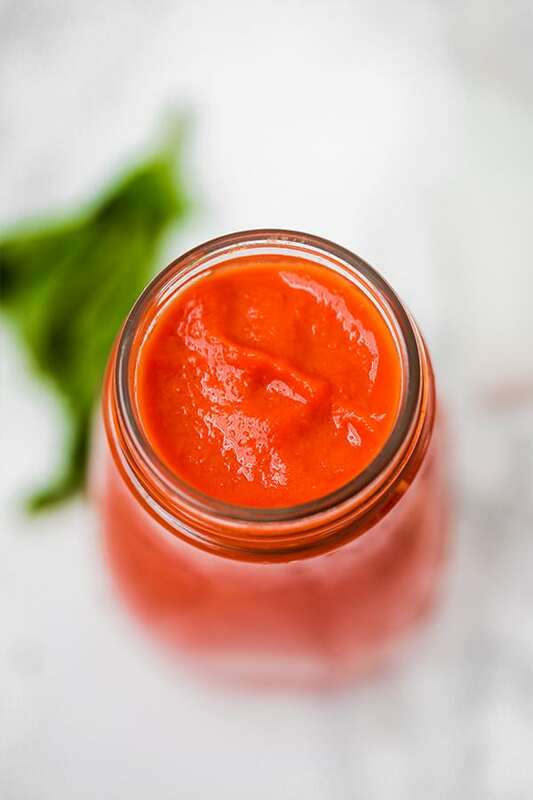 Once depressurized, remove the lid and allow for the sauce to cool before blending it in a Vitamix or high speed blender until smooth. Season further to taste and enjoy! To adapt for the stove, use a large, deep sauce pot to saute the garlic and onion on low heat in olive oil until softened. Add the remainder of the veggies and saute for a few minutes. Add about 1-1.5 cups of water to the pot (just enough to cover the veggies) along with the herbs and bring to a simmer for about 30 minutes or until the veggies are completely softened. Allow to cool. Pour off some of the water if a thicker sauce is desired. Combine all of the of the veggies and seasonings with the lemon juice in a blender and blend until smooth. The pasta in the background of the pictures is GF chickpea pasta, and is not AIP or paleo. See suggestions above for more options for what to pair this sauce with. All nutrition information is an estimation and will vary. Thank you for this practical and very much needed recipe! Do you think the prepared sauce could be frozen? What can you use instead of carrots, due to carrot allergies? I don’t know if there’s a good swap for carrots here. Sorry! Maybe sweet potatoes or yams? Can you recommend anything to sub for the carrots? I am allergic. I haven’t tried any sub for the carrots… sorry! OR.. place all ingred except water and lem. Juice in Food processor to chop. Sautee in deep cast iron pan, add water to cover. Cook till tender..cool toss back into blender..with lemon juice. Buddabim. I’ve not used my Instant Pot, but I’ve made this several times using the “on the stove” method. I like it as a substitute for tomato sauce, but my husband, who usually like beets but doesn’t have to avoid tomatoes like I do, doesn’t care for it. The sauce DOES freeze very well. I add extra olive oil to it because it tends to dry out and burn when put on chicken as a “barbecue” sauce. You can 🙂 I like to double the batch and freeze half in 1 cup portions so I don’t have to make it as often. This sounds awesome. If I’m trying to make a low acidic sauce due to acid reflux can I just leave out the lemon juice? Or maybe that wouldn’t matter like real tomato sauce.. If you’re sensitive to it, you can leave it out. Hi, about to try this recipe (so excited), I was just wondering if all of the herbs are fresh? You specified fresh basil, but not oregano and parsley, are the other two dried? I use dried herbs for the oregano and parsley 🙂 Enjoy! I made this sauce tonight, and it is delicious! It tastes just as good as a real tomato sauce to me. Thank you for the recipe, Michelle! YAY! Thank you so much!! I am so glad you enjoyed <3 thank you for trying and commenting! Why does it have to cool before blending? For taste or safety. And I didn’t have oregano (went to the store 3 times and forgot this still, pregnancy brain) so I hope it turns out ok, crossing fingers. The pressure from the heat can blow the lid off of the blender and make a huge mess and burn you… I’ve done it before and it was not a fun mistake! impressed with the tomato-ey flavor. goes great for nomato cabbage roll casserole. I made this last night for lasagne, subbing balsamic vinegar for lemons. I did the stovetop method and my blender didn’t exactly hold up to the task; it’s a bit chunky… and SO DELICOUS. I could eat it by the spoonful. Thank you!! this smelled amazing while it was cooking, but after blending and tasting the celery taste was a little too strong for me. Next time I would probably do half the celery. I added more seasoning and added 10 kalamata olives and blended again and it helped bring some unami to it. Delicious! Good recipe over all! Thanks! 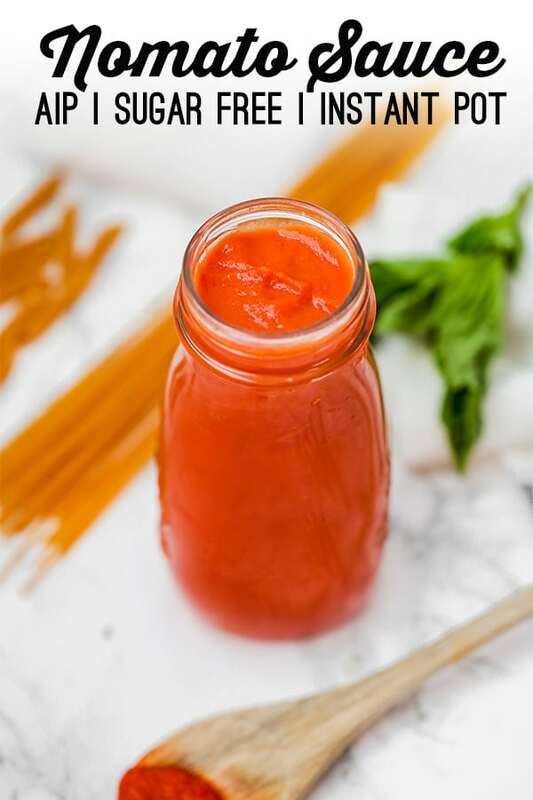 This was my first AIP recipe venture and it was not only delicious and satisfying (and so surprisingly similar to a tomato based marinara), but it gave me confidence that I can navigate this and be successful. My husband and daughter even love it! I added grass-fed ground beef and we’ve had it over zucchini noodles and on cauliflower pizza crust. Going to try Breana’s suggestion of adding kalamata olives to my leftover batch next time. I am grateful for your blog, Michelle. Thank you! I’m really wanting to try this ….are your beets cooked( fresh) prior to putting them into pot ? Or canned ? Happy happy happy!! I just made this and so full of flavor. I have missed ketchup and marinara sauces. Thank you thank you for sharing. Ah, thank you so much Melody! I’m so happy you enjoyed it! I made this tonight! It was excellent! Thank you so much for the recipe!! Loved this! I can’t wait to share with the kids I made it for (mine) who are wheat/gluten free, dairy and egg free. It’s been a journey. I look forward to to what you cook up next! Can you sub celery here or just leave it out? I haven’t tried it, but let me know if you do! I’m so happy you liked it, Debbie!! Thank you so much! This was so easy and tasted SOOO good! I had mine with grass fed ground beef and zoodles. So happy you liked it, Joan!!! Do you know how long this can stay fresh in the refrigerator? Parsley is actually not a nightshade. Tomatoes, potatoes, eggplant, and all peppers and red spices are nightshades, but green herbs are not nightshades. I’ve just started aip, I’m so happy to find this recipe! Is the beet raw when it goes in the instant pot please? All of the vegetables are raw, yes 🙂 Enjoy! Want to try this and believe me I understand that onion and garlic would make this so great, but I don’t tolerate these FODMAP foods can mess with me too I know there is and replacement I just have to order it. I think it starts with and A. Would have to look it up to share. Maybe you know what it is. thank you for the recipe. You can try and leave it out. It will have less flavor but you can just add more herbs! I made this and really thought I followed the directions but I ended up with a sauce the color of an orange/light mustard sauce. Maybe I didn’t add enough beets? In any case- it still tasted good and the kids liked it. It may just be the beets that you used… I’ve definitely seen the beets drain their color once or twice.